The Mystical Mystery Bundle is up for grabs at discounted prices from the 21st to 30th of April. But from the 21st to 26th of April you have a chance to win it for free. Scroll down for more details on how to participate in the giveaway. Before I tell you more about The First Lie, Virginia King and the giveaway, here’s a question I asked Virginia about her book. Your character Selkie Moon was named after a Celtic fairy tale. Why did you choose this folklore? How has it added to the supernatural element of the book? The selkie myth has haunted me for many years. When I worked for a children’s publisher, I helped put together a collection of myths from around the world and I got hooked by their symbolism. The selkies are the seal people who peel off their skins to dance in the moonlight on human legs. In the myth, a fisherman falls in love with one of the selkies as he watches her dancing and steals her skin so she must marry him. She’s never quite herself and when she finds where he’s hidden her skin seven years later, she returns to the sea without looking back. The First Lie is not a retelling of the selkie myth but I’ve played with it to add supernatural layers to the mystery of a modern woman. Selkie Moon has run away to Hawaii and landed in the middle of a series of bizarre happenings that are tangled up with both Celtic and Hawaiian mythology. Selkie has been living a lie without knowing it – The First Lie. And just like the selkie whose pelt was stolen, her very life depends on finding what she’s lost – by returning to the place where it all began, without looking back. Virginia King has lived most of her life in Sydney, Australia, but has travelled to many places. 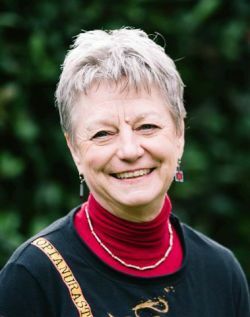 She’s been a teacher, an unemployed ex-teacher, a producer of audio-books, a writer of over 50 children’s books, a writing workshop presenter and an award-winning publisher. 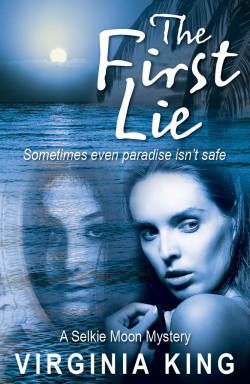 The First Lie is her debut novel for adults, the first mystery in the Selkie Moon series. These days Virginia lives with her husband in the Blue Mountains west of Sydney overlooking a valley full of birds. Most mornings she does some yoga, watches the French news (even understands some of it), then sits down and writes till late in the afternoon. Bliss. In the Rafflecopter widget below choose which series you would like to learn more about. This will enter you in the drawing. To get an additional entry, click on the option to tweet the give-away. The giveaway will run from April 21 (midnight US Eastern time) to April 26 (midnight US Eastern time). The winner will be announced on April 27, 2015. Just in case the Rafflecopter widget isn’t showing, click here.